Russian President Dmitry Medvedev has dismissed the head of the country's powerful GRU military intelligence service, the Kremlin has said. Mr Medvedev signed a decree on Friday replacing Gen Valentin Korabelnikov with Gen Alexander Shlyakhturov. Officials gave no reason for the move. Gen Korabelnikov had led the Main Directorate of Intelligence since 1997. He reportedly tendered his resignation earlier this year over objections to proposed reforms of the agency. The Main Directorate of Intelligence (GRU) of the General Staff is Russia's largest intelligence agency. It is believed to have six times as many agents in foreign countries as the Russian Foreign Intelligence Service (SVR), one of the successors to the Soviet KGB. In a statement on Friday, the Kremlin announced that President Medvedev had signed a decree that "released" Gen Korabelnikov from his post and from military service. The BBC's Richard Galpin in Moscow says this is potentially one of the most significant decisions Mr Medvedev has taken since being sworn in almost a year ago. It reinforces statements he made last month that he intends pushing ahead with a major overhaul of the armed forces despite opposition from some senior officers, and that those who do stand in the way such as the military intelligence chief risk being swept aside, our correspondent says. Gen Korabelnikov had been the head of military intelligence for 12 years and was a four-star general. Analysts say the 63-year-old was one of the main opponents of the planned military reforms, which could see the Russian armed forces shrink from 1.3 million serving men and women to one million. The majority of those cuts would come from the officer corps, which could see the loss of around 200,000 posts, including many generals. Some of the proposed reforms were said to have included the disbanding of several GRU-controlled army special forces (Spetsnaz) brigades and the redistribution of the command of some GRU structures to the SVR. Gen Korabelnikov is reported to have submitted his resignation in protest last November. When rumours again circulated in March, defence officials announced that his term of service had been extended by two years. Unnamed GRU sources told Russian media that one of the reasons why the general's resignation had not been accepted at the time was that many of his deputies had refused to assume his post. The Kremlin said the new GRU chief, Gen Shlyakhturov, had been one of Gen Korabelnikov's deputies. He is reportedly seen by some in the military as a more compliant figure who may not challenge ministers. 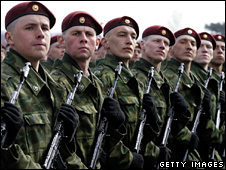 Although President Medvedev has insisted that the reforms of the military will go ahead, it is not clear when, our correspondent says. The country is in the grip of a severe economic crisis which has already seen millions of people thrown out of work, he adds. In a separate development, three districts in Chechnya have been officially designated zones of counter-terrorist activity only a week after Russia said it had ended its decade-long military campaign against separatist rebels in the southern republic.